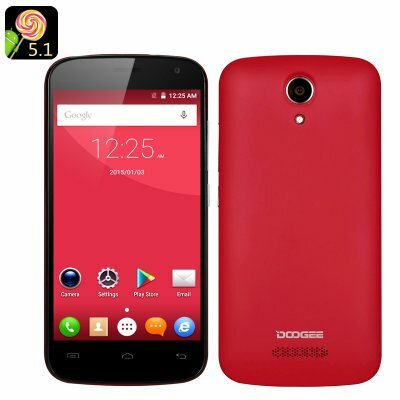 Successfully Added DOOGEE X3 Smartphone - 4.5 Inch Screen, Android 5.1, 2 SIM, Bluetooth 4.0, Smart Wake + Gesture Sensing, GPS Support (Red) to your Shopping Cart. The DOOGEE X3 is budget smartphone with a nice design, compact 4.5 inch screen, Android 5.1, Smart Wake + Gesture Sensing, GPS Support, 2 SIM cards and more. You don’t have to drop the big bucks on a smartphone - it’s as simple as that. If all you are looking for is efficient functionality, smooth operation, good connectivity and reliability – you can have all of that (plus a few fun extras) with the DOOGEE X3. This budget Android smartphone has a lot to offer and won’t have you stressed put about credit card bills. The DOOGEE X3 comes with Android 5.1 operating system and you can benefit from all the upgrades and improvements the OS has to offer. Moreover, you will have two fun features to explore and play around with: Smart Wake for quick access to apps from the locked screen and Gesture Sensing for gesture control of certain phone functions. Bluetooth 4.0 guaranteed efficient communication with other devices: hook up your wireless headphones, speakers or connect to your PC. With two SIM cards, you will be able to split work and fun and the 1800mAh battery will give you plenty of juice for lengthy conversations. The smartphone is powered by the MTK6580 Quad Core CPU and comes with Mali-400MP GPU for smooth operation and efficient gameplay. You will have two cameras, 8GB of internal storage and the support of a 32GB SD card.